Wetter, Germany –The Belgian cement manufacturer CBR, a subsidiary of the HeidelbergCement Group, has automated the raw material store that it operates at its Lixhe location. The performance of the facility has been significantly increased by the installation of a Demag warehouse management system and a Demag process crane that has a load capacity of 9 tonnes. Lutz Dowy, Vice President Sales and Product Management at Terex Material Handling, explains: "We modernised the store operated in Lixhe by CBR with a strong solution based on rugged crane systems and smart control modules. The result will ensure a continuous material flow thanks to consistently high handling rates." HeidelbergCement addressed three clear goals with the automation of the raw material store at its Belgian plant in Lixhe: increased productivity, sustainable improvement in process reliability and a higher level of occupational health and safety. To meet these requirements, a fully automated crane was installed and a warehouse management system was implemented in the existing store. For the supply of the materials handling equipment and the software control system, the cement manufacturer decided in favour of a complete Demag system, which was used to thoroughly modernise the store. The Lixhe plant is one of the oldest locations operated by the cement manufacturer CBR, a subsidiary of the HeidelbergCement Group. With an annual capacity of some 1.4 million tonnes of clinker and 1.5 million tonnes of cement, the plant in south-east Belgium is the largest cement works in the Benelux countries. Besides the calcareous sand which is quarried locally, three grades of coal as well as ferric oxide are kept in the raw material store at the plant. The storage area measures 86 x 24 m in size and has five compartments that are divided into eight storage zones. Since the store is served by a bridge crane, the owner benefits from full utilisation of the available space, as the crane can reach virtually any point in the store. This work was previously performed by a manually operated 9 t overhead travelling crane. Bertouil Hugues, who is responsible for maintenance at the Lixhe plant, explains: "The old crane installation had to be replaced because the electric equipment no longer met current standards and the structural design of the crane had to be revised. The crane also needed to be used in continuous 24/7 operation. This was no longer economically feasible with a manually controlled crane." 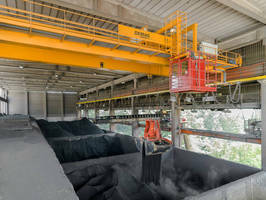 An automated Demag double-girder overhead travelling crane that is equipped with a 3.2 m³ powered clamshell grab is now used for handling the raw materials. Like its predecessor, the process crane has a span of 24 m and a load capacity of 9 tonnes. Rugged and reliable crane components provide for continuous operation in the harsh environment. Efficient operation of the crane is also supported by high speeds (long-travel motions at 100 m/min, load-dependent lifting motions up to 90 m/min) and integrated load-sway damping. The crane installation is primarily used for clearing the tipping pit and for filling the chutes with the required blend of materials, which is ensured by crane weighing devices. The blend and order in which the material is added is precisely defined by the Demag warehouse management system, which controls the feed schedule to the kilns and facilitates transparent inventory management. Scanner systems were installed on the crane installation to measure the height of the aggregates. The scanners fitted below the crane bridge continuously track the height contours of the stored bulk material each time the crane travels over it. The software in the crane control centre uses the information to determine a constantly updated height profile and visualises the fill levels in all storage areas, including the minimum and maximum values. In addition, the control centre shows the current status of the crane with all relevant status messages. Customer-specific storage strategies can be added via the user-friendly interface at any time. Some six months after the installation entered service, Bertouil Hugues made an initial assessment: "The automation of the processes has enabled us to boost the efficiency of our raw material store. Besides the higher handling rates provided by the crane system, its continuous operation without the need for any breaks has also contributed to the result. In addition, we have considerably enhanced the stability of our processes and further improved the safety of the working environment for our employees." Terex Corporation is one of the world’s leading suppliers of crane technology with Demag industrial cranes and crane components. The core competence of the Terex Material Handling business group lies in the development, design and production of technically sophisticated cranes, hoists and components and the provision of services for these products. The business group manufactures in 16 countries on five continents and is present in more than 60 countries, reaching customers in more than 100 countries. Terex Corporation is a diversified global manufacturer engaged in the mechanical and plant engineering sector. A core activity of Terex Corporation is the provision of reliable, customer-driven solutions for many applications, including the construction, infrastructure, shipping, transportation, quarrying, mining, refining, energy, utility and manufacturing industries. Terex reports in five business segments: Aerial Work Platforms, Construction, Cranes, Material Handling & Port Solutions and Materials Processing. Terex Financial Services offers a wide range of products and services to assist in the acquisition of Terex equipment. Please visit our websites at www.demagcranes.de and www.terex.com for further information. Warehouse Optimization Services use OptiSlot DC™ software.